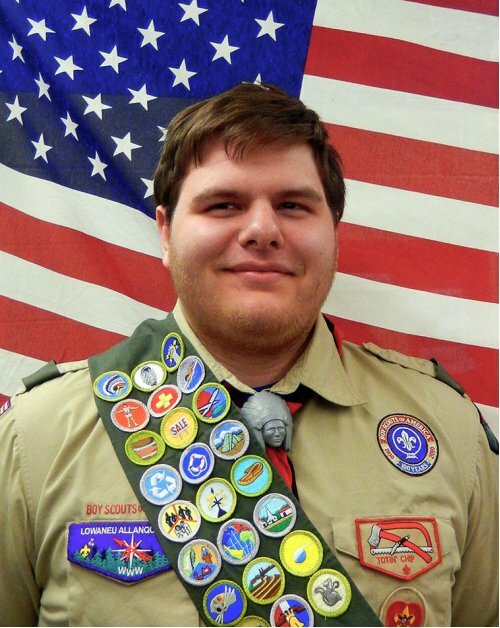 Matthew West, a member of Boy Scout Troop 33 chartered at First Lutheran Church in DeKalb, recently was awarded the Eagle rank, the highest award achievable in the Boy Scouts of America. He is the son of Larry and Debbie West of Malta. West first began Scouting with Cub Pack 123 in Malta where he earned the Arrow of Light Award, the highest award in Cub Scouting. He crossed over into Troop 33 in 2008 and has enjoyed several years of exciting year-round outdoor adventure. He earned 28 merit badges in pursuit of the Eagle award. West attended several week-long summer camps at Camp Lowden near Oregon, Illinois. He exhibited excellent leadership skills while helping younger Scouts at camping activities. He was elected into the Order of the Arrow, Scouting's National Honor Society. One of his favorite trips featured backpacking at the Black River State Forest in Wisconsin where he enjoyed hiking with full pack on challenging trails. Overnights were at undesignated campsites. Scouts used judgement to choose where to establish their campsites within a wilderness area. West's Eagle service project involved the Malta Township Library where he removed old fixtures from the building to refurbish an area with new woodworking and shelves. West is a senior in the Class of 2016 at DeKalb High School.